I have fished the last 16 March 15th and witnessed wind (from all directions), rain, snow, bright sunshine, cloud, clear blue skies, frosts and believe it or not all of these on the same day. The only predictable thing about the weather on this Atlantic island is that it is not predictable, changeable is the safest thing to say. Apart from one year (foot and mouth so I fished another loch nearer home) I start the season on Caversta Lochan, it would be easy to drive past it. The reason you do not is that this is one of the few waters that you will see rising fish no matter what the weather. Why? 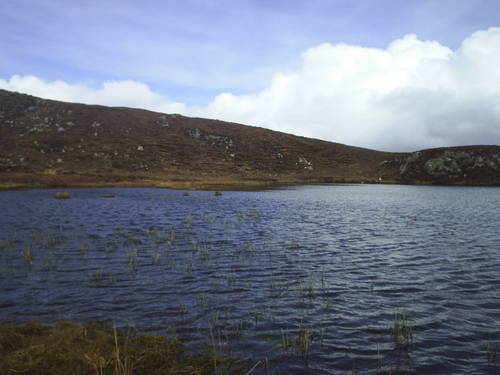 The Lochan is small and shallow, later in the year it is almost totally weeded over with lillies and the like, the shallow water ? (2 to 3ft) heats up quickly in the spring sunshine and midges, small grey and black hatch through the day as long as the cold east wind is not blowing. The first picture shows the shallow water with marginal weeds already showing, further out patches of lillies that have not completely gone from last summer, the lochan was frozen for weeks over the winter, trout are active in the clear water between the weed clumps. 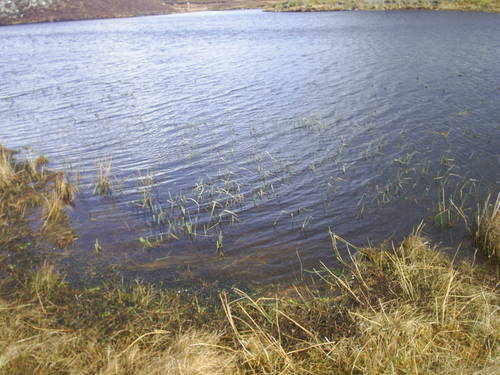 Try a small weedy loch near you and let me know if the fish are rising in March. 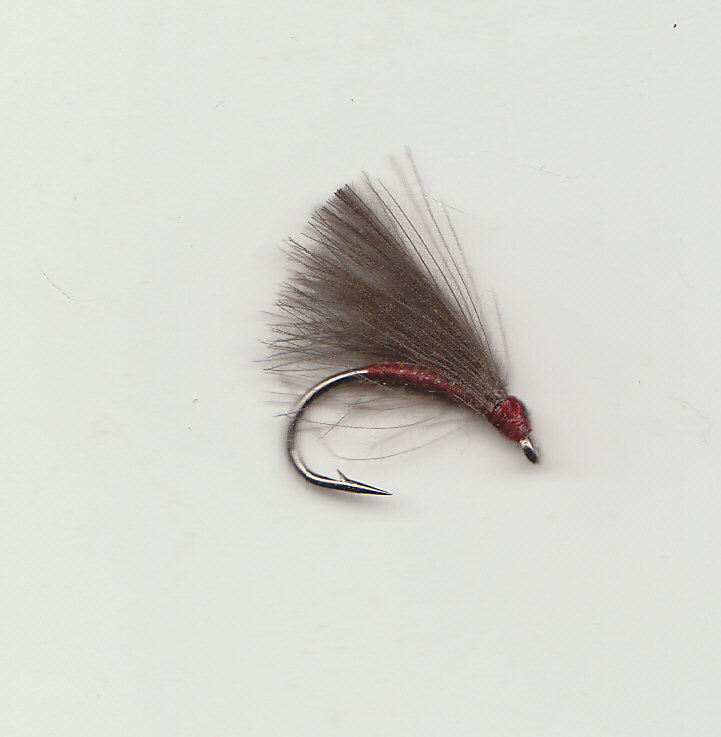 Right now to flies and tactics. Most of this lochan can be covered with casts between 2 and 10 yards, I use either a 9 foot AFTM 6/7 loaded with a #5 floating line, or the same line on a 8.5ft AFTM 4/5 rod. The longer rod is better in a stiff wind and if Goldbead or leaded flies are needed. 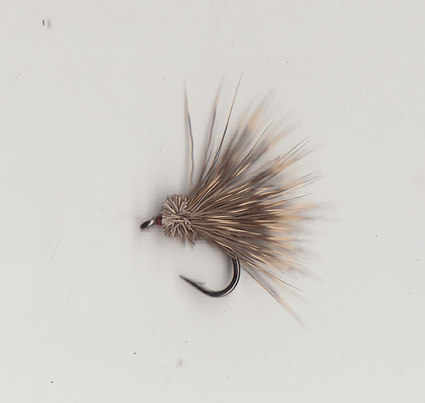 The lighter outfit is great in a light ripple and suited to presenting dry midges and or swimming buzzer and emerger patterns. (which I keep short) where the two meet. no sign of any insects on the wing or water surface, the fish were rising to something in the film, probably drowned adult midges or drifting pupa, alive or dead, I suspect lots of pupa die in the act of trying to hatch. In these conditions I would start with a DEER SPIDER on the dropper and a BLACK BUZZER on the point. 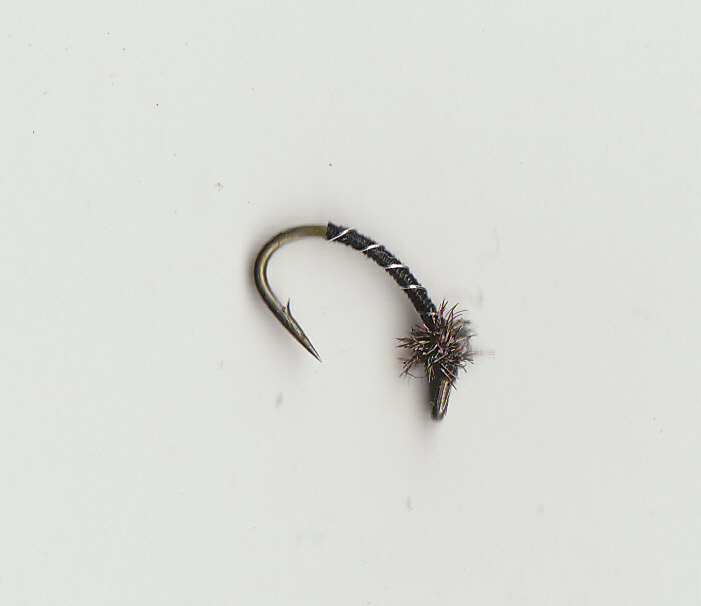 Early season rising trout are usually taking midge pupa with black and grey being the most likely colours. The Deer Spider might well tempt a fish, but its real role is to act as a strike indicator, the Buzzer covers any sub surface feeders. The first fish to be covered is about a yard from the bank, with weeds and water preventing a up bank cast I end up casting over dry land with only a some fly line on the water, the fish slashes at rhe Deer Spider, a flick of the wrist and I miss him, not too surprising, rusty after the long winter! As more fish rise in the mid day sunshine I start to pick up fish, some on the buzzer and the odd one on the Deer Spider, lots of fish slash at the surface pattern and I fail to connect, I am not sure that they are taking the fly, but this response shows they are looking in the surface for food so off comes the Buzzer and on with a CDC 'F' Fly #14 (red) which fishes in the film or near it, depending how many false cast you make! This is the answer as several fish come to the net. No monsters in this lochan so all the fish are in the 6 to 10" bracket, but just the thing for the opening day in spring sunshine. Always remember that a good fish is one you enjoyed catching and that ounces are a poor measurement of the stature of any fish. All the fish are coming from a clear piece of water 10 by 15 yards, between the old weedbeds, the dropper is fine in this situation, on other occasions with larger fish and more weed about I would suggest one fly would prevent snagging up, lost fish and tackle. On another opening day conditions can be less than pleasant! One year I struggled in high wind and scattered sleet showers to tempt a fish. I ended up in the most sheltered corner with two LEADED LARVA #10/12 on a 12ft cast with 12" between point and dropper, casting out and letting them sink the 3 to 4 foot 'deep' corner and inching them back as slowly as possible, more a case of keeping the short line cast (always easier than a long line) as tight and as controlled as possible with numb fingers and finally the line tip dipped and a frozen trout was on the end. However that was the exception to the rule, most opening days have been sunny, breezy with showers, which come to think about it is what you can expect up here at any time of the year. HEADING TO THE HIGHLANDS & ISLANDS?